Hazmat storage containers by US Chemical Storage are designed by our certified professionals to provide full compliant solutions for all your chemical storage needs. The foundation of our chemical storage buildings is designed for increased safety when storing chemicals and provides a superior product, when compared to our competitors. The 12-gauge, heavy-duty steel construction on our buildings provides maximum protection to your hazardous materials storage. Our hazmat storage containers are layered with an extremely reliable and durable epoxy coating for protection from harsh weathering conditions and chemical resistance. Our teams of experienced engineers are very detail oriented and design extremely strong and compliant hazmat storage containers. All of our chemical storage buildings are pretested before they leave our factory. We offer a longer warranty than our competitors, because we stand behind our product. Our FIRELoc hazmat storage containers maintain your flammable materials compliantly and safely. Secure you flammables with our 2-hour fire rated storage building, while keeping your storage managed with our fire suppression systems. 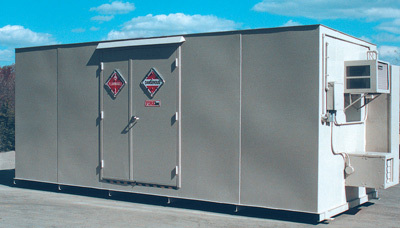 Our FIRELoc storage buildings are constructed from heavy-gauge steel and designed to house flammable hazardous materials. Our chemical resistant epoxy based paint ensures that your chemical storage will be maintained and kept safe. All of our hazmat storage containers are hand-welded by professional certified welders. Match your hazmat storage containers with our fire-rated roll-up doors for easy exit and entry. Our heavy-duty access ramps provide you with the ability to drive a forklift into your storage building with ease. 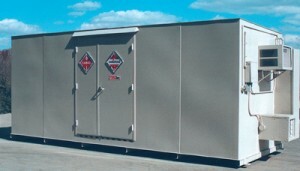 Keep your flammable storage safe and compliant with a hazmat storage container by US Chemical Storage.